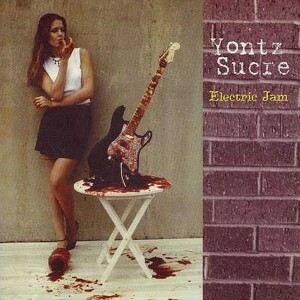 After a 38-second ambient intro that slowly morphs into feedback, North Carolina guitarist Yontz Sucre launches into the first of several smokin' guitar instrumentals that grace this, his debut release. Yontz covers the territory well, from the pedal distortion metal chords on "Uncaged" to spastic screaming guitar leads that blow out the fuses on "Blue Breeze," from the savvy melodic leads over acoustic backing on "Reverie" to the chunky Arabesque textures on "Casbah," he has it all covered. For a comparable performance one could seek out classic material by Alvin Lee or Robin Trower, or recent ascents by Satriani or Vai. He plays all instruments (multi-guitars, basses, and respectable drum programming) throughout the album until we get to his spirited cover of Jimi's "Little Wing" at the end of the disc, where he's finally joined by other musicians on bass, drums, and keys, and for the first time — vocals. Influences abound, yet any obvious connections have been well absorbed; surely one can hear a bit of this and a bit of that, but there's more than enough originality in his playing and compositions to challenge the sense of familiarity. An impressive start for a guitarist we'll hopefully be hearing a lot more from in the future. Recommended.